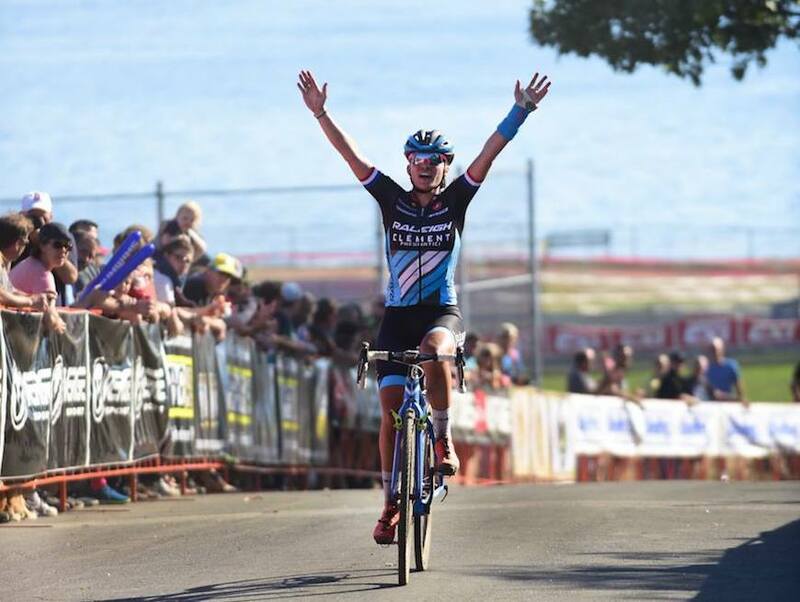 The Raleigh-Clement professional team battled through injury and bad luck to produce its finest weekend of elite racing so far this season, in Gloucester, Massachusetts, with a win and two additional podium spots. A broken wrist bone didn’t stop Caroline Mani from pursuing a win. She started in Gloucester wearing a cast that was wrapped around her left wrist and forearm just this week. Saturday she placed a solid fourth. The wrist hurt over the bumpy course, but Mani took the pain in stride. Braking was difficult. She couldn’t grab the handlebars and stand on the pedals. So she adapted her racing style, relying on generating power in the saddle. After carrying the bike to the top of a set of stairs in the final lap she realized she remounted faster than her adversary. That’s when she attacked with everything she had. “I didn’t want to bring her into a sprint because I cannot really sprint right now,” Mani said. The gamble paid off with Mani’s first win in three years at the highest level of cyclocross racing. Now she’s hungry for further victories. Her teammate Jamey Driscoll began the weekend plagued by bad luck. He started super-fast on Saturday. But in that sprint he ripped one foot out of a pedal and the force dislodged his chain. While adjusting the bike thirty or more riders passed him. He spent the better portion of the hour-long race maneuvering through rider traffic. Finally with two laps to go he reached the chase group. Then he crashed after clipping his pedal in a turn. 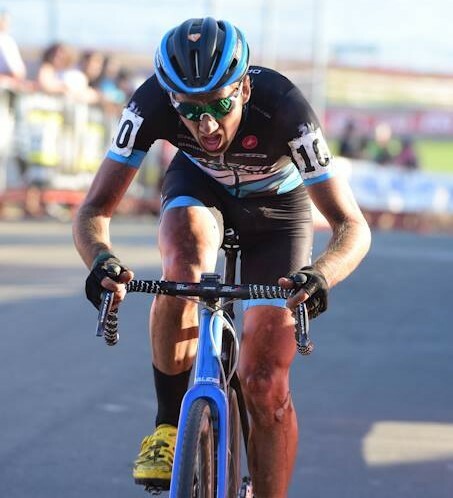 In a show of extreme determination, he found his bike and surged up to and through the group to teammate Ben Berden, whom he led out for a third place finish. Driscoll came in fourth. Sunday’s competition started off slowly but Driscoll kept the leaders in sight. About midway through the race he caught and passed the chase group and set off after the sole leader and dominant elite man of the season, Jeremy Powers. Driscoll established a solid gap over the chasers and scored second just eight seconds after Powers. It was his best result of the season and he’s excited to be back in the hunt for the podium. Erica Zaveta, the Amy D. Racing rider supported by the Raleigh-Clement team, also battled a bit of adversity. A lingering cold almost kept her in bed on Sunday, but she nudged herself to the start line and finished sixth, her best result ever against such a strong field. The Raleigh-Clement team now moves into training mode in preparation for one of the biggest cyclocross events of the season this coming weekend, the KMC Cyclo-cross Festival in Providence, Rhode Island. Missed the live feed? Watch the Rapha Super Cross Day 2 here.